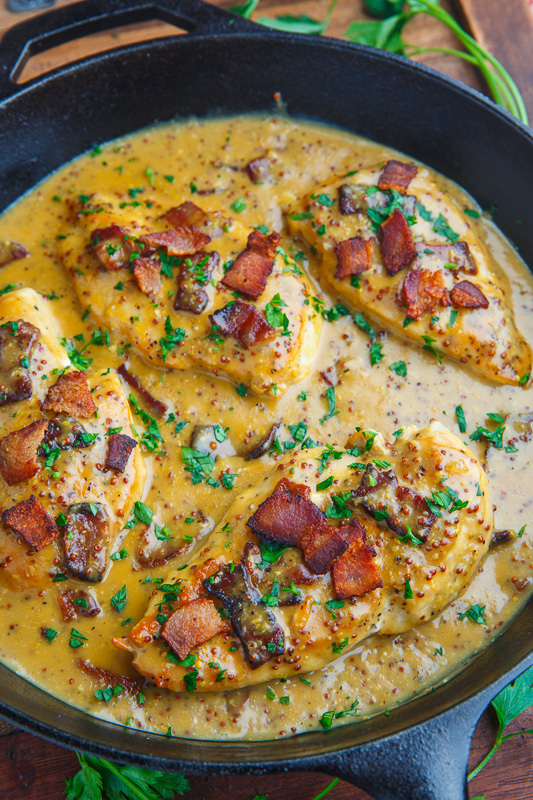 A quick and easy skillet chicken dinner in a creamy honey dijon and bacon pan sauce! 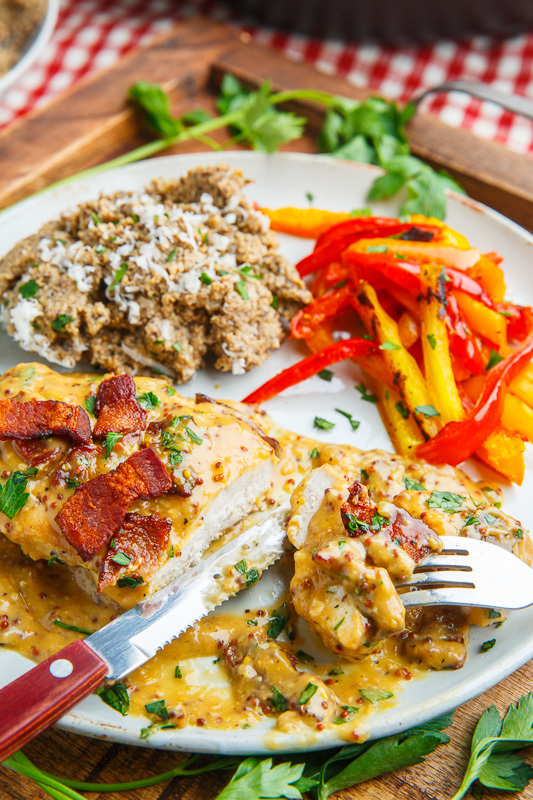 Quick and easy chicken dinners are always welcome and this creamy bacon honey dijon chicken is the one that I am currently crushing on! 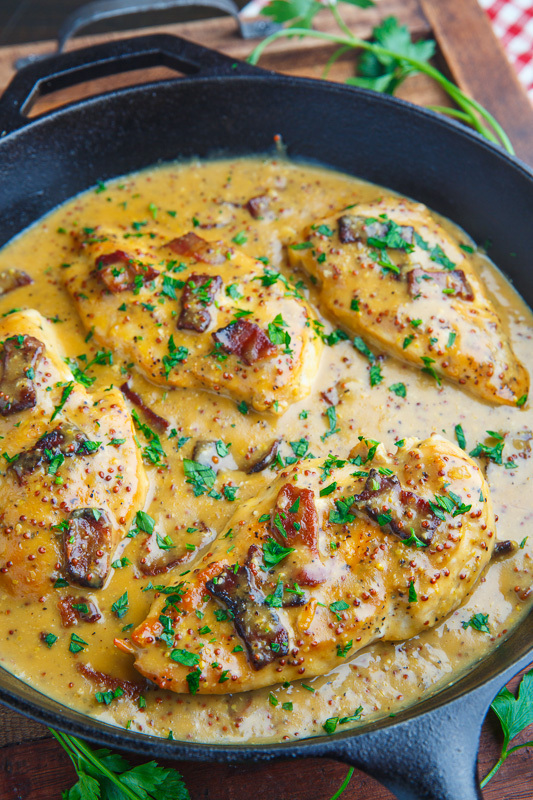 It’s such a nice and simple one-pan dish with a super tasty skillet sauce! 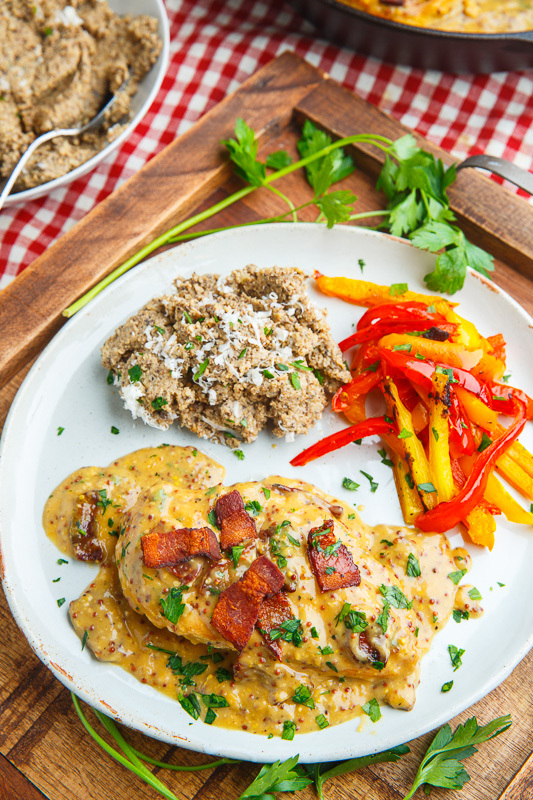 It starts off with some bacon which is cooked in the skillet before adding the chicken to cook in the bacon grease followed by the sauce with the classic, and so amazing, honey-mustard flavour combo! I like to make this sauce velvety and good with the addition of cream but it’s also fabulous, and a little lighter, without it! I like to add a bit of white miso paste for a bit of saltiness and that extra umami/flavour kick and a splash of vinegar adds a bit of bite to the sauce. 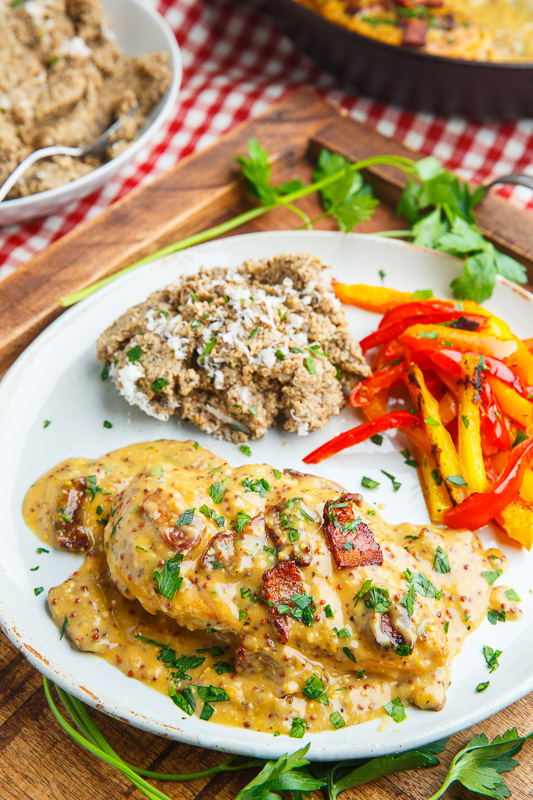 This creamy bacon honey dijon chicken only takes 30 minutes to make so you have plenty of time to make some rice or pasta, or quinoa, etc to serve it on and steam some veggies or make a salad to complete the meal before while cooking it! Cook the bacon in a skillet over medium heat and set aside. Season the chicken with salt and pepper to taste and cook in the bacon grease in the skillet over medium-high heat until cooked and lightly golden brown, about 3-5 minutes per side, before setting aside. Add the chicken broth and deglaze the pan by scraping the brown bits from the bottom of the pa as the broth sizzles. Add the honey, mustards, cream, vinegar and miso paste, mix well, add the chicken and bacon, bring to a simmer, reduce the heat and simmer until the sauce thickens a bit, about 5 minutes. Option: Omit the bacon and use 1 tablespoon oil instead of the bacon grease. Option: Replace some or all of the chicken broth with white wine. Option: Add a diced onion and cook until golden brown after removing the chicken and before adding the garlic. Option: Add hot sauce such as sriracha for some spicy heat! Option: Add 6 ounces baby spinach at the end and let it wilt before removing from heat. The perfect chicken dinner! Love this! My boys would love this for dinner! Looks amazing, but I'm curious what is on the plate that you served with it besides the peppers? Thanks! Amazing! My kids will love this chicken! these flavors are just perfect together Kevin! I know my family would love this dish! Yum!